As much as I do not like the word asymmetrical in regards to musculoskeletal care for many reasons, we cannot neglect its role in the history of our profession. Historically, clinicians would eye-ball range of motion and even use palpation to determine deficits side to side with resultant definitions and/or descriptions to the patient that could be the reason for his/her symptoms. We all know the reliability and validity of these measures have their own downfalls and with advanced scientific scrutiny of our own tests, these methods are dying out. However, there is one test that has been shown to be valid, reliable and useful in the differential diagnosis of certain conditions. This test is the Flexion Rotation Test. Back in 2004, Hall & Robinson were the first (to my knowledge) to study and cite the Flexion Rotation test in a comparative measurement study for Cervicogenic Headache. This test has stood the test of time and continues to be highly valuable in studies examining the upper cervical spine. I wrote a 3 part series on it over 8 years ago (Part 1, Part 2, Part 3) and still use it consistently to this day! Even though the Flexion Rotation Test has been validated in Cervicogenic Headache and continues to be a major player in a battery of examination tools for Musculosketal dysfunction in Migraines, its role in diagnosing Cervicogenic Dizziness as a valid measure is lacking. The purpose of the Flexion Rotation Test is to measure the mobility at the atlanto-axial (AA) joint, which of course is in the upper cervical spine complex. It encompasses 50% of the rotation of the cervical spine and a major musculotendinous attachment point. Even though the neurophysiology of nocioception from the upper cervical spine to produce Cervicogenic Headaches is more common, there is a plethora of information on the proprioceptive neurophysiology from the upper cervical spine to produce Cervicogenic Dizziness. Most recently, Quek et al 2013 sought out whether the upper cervical spine rotation ROM asymmetry is associated with postural stability. The authors found Cervical Flexion-rotation ROM asymmetry group had greater postural sway and from a statistical analysis viewpoint, the study emphasizes the need to consider Cervical Flexion-rotation-ROM asymmetry as an independent predictor of standing balance, over and abovethe influence of neck pain intensity. This is a powerful statement and considering we are dealing with altered orientation, dysequilibrum, and unsteadiness with Cervicogenic Dizziness; we can’t ignore this striking finding on correlating postural stability with AA mobility. However, for MORE diagnostic power in evidence-based practice, we need MORE than just conjecture from basic science and relating range of motion to postural stability. 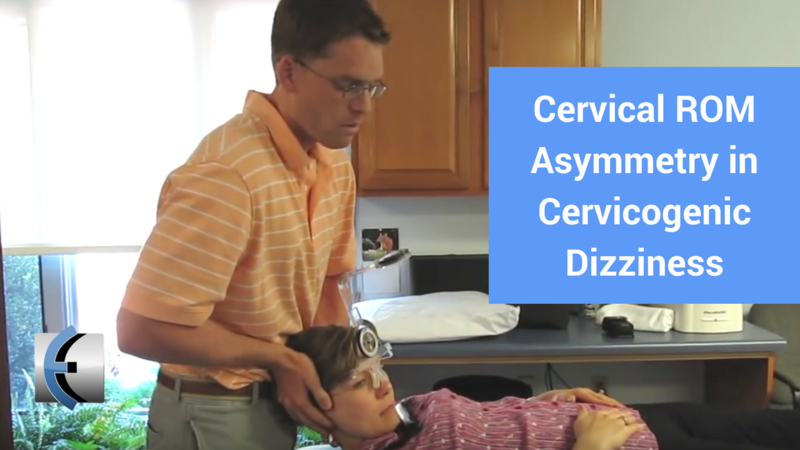 The clinical reasoning process to diagnose Cervicogenic Dizziness takes the basic science, add a screening process via the Optimal Sequence Algorithm , obtain the appropriate subjective and other objective testing measures—including the Flexion Rotation Test—and BAM…make the clinical diagnosis…doesn’t this count as validation? Honestly this is what we currently have in regards to using the Flexion Rotation Test for Cervicogenic Dizziness. We don’t have a true validation study as we do with Cervicogenic Headaches, but we do have some more oomph from the ivory towers to help make our decision. To assist with our argument, we have case reports (Gargano et al 2012), case series (Escaloni et al 2018, Jung et al 2017) Delphi Study (Reneker et al 2015), case control study (Morgan CD et al 2015), reviews (Cheever K et al 2016) and position statement (Harmon et al 2013). These literary works all discuss and/or use the Flexion Rotation Test for Cervicogenic Dizziness. One thing I want to point across is the lack of validation of a test does not mean you can’t make inferences. With basic science input from C0-3 and several studies demonstrating the abnormal findings of C1-2 via the Flexion Rotation Test relating to patients with dizziness, we can’t ignore this excellent test. Use it but use it with strong clinical reasoning for your patients with dizziness to determine how much could be musculoskeletal in nature. You can learn more about the screening and treatment process of Cervicogenic Dizzinesss through Integrative Clinical Concepts, where the authors (husband–a manual therapist a wife—a vestibular specialist), teach a very unique course combining both the theory and practice of vestibular and manual principles in their 2-day course. Pertinent to this blog post, the 1st day includes the “Optimal Sequence Algorithm”, a multi-faceted physiotherapist approach to the assessment of Cervicogenic Dizziness, which includes the appropriate ruling-out process and cervical examination of the articular and non-articular systems.